The Martin Van Buren Presidential Dollar marks the eighth in the series. The coins were first released into circulation on November 13, 2008. 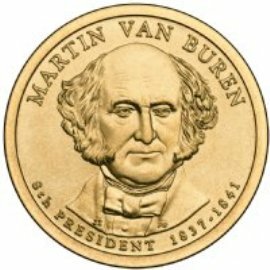 Van Buren only served one term in office from 1837 to 1841. Some fun facts about Van Buren include being the first president to be born in the new United States. He also raised his four sons after his wife died. Van Buren also opposed making Texas a state. One other thing that he was known for is ordering over 20,000 Cherokee Indians to move from the eastern states to Oklahoma in what was to become known as the Trail of Tears. The obverse of this golden dollar shows a portrait of him with his name inscribed above, and "8th PRESIDENT 1837-1841" inscribed below.